Providing trusted home care for over 40 years. Providing home care is a relationship built on trust. Allowing professional caregivers to enter your home to deliver care so you can age independently and safely in your home is a personal service. Therefore, it’s important that you are thinking of your safety when exploring your home care options. For the VNA, delivering quality care to our clients means putting their safety first. The VNA is a licensed and accredited company that employs its staff. As an agency, we are responsible for the actions of our staff and implement policies to protect our clients. VNA staff undergoes background screenings, driving checks and are randomly drug tested. In addition, the VNA provides its staff with ongoing education opportunities to ensure that our nurses, home health aides, clinicians and staff have the most up to date information available. A private hire is simply that – someone who is autonomous and works for themselves without any reporting to supervisors. When it comes to hiring a private caregiver, the responsibility of doing a background check, drug test and purchasing insurance falls solely on the client. Home care agencies must adhere to certain regulations when it comes to background checks. 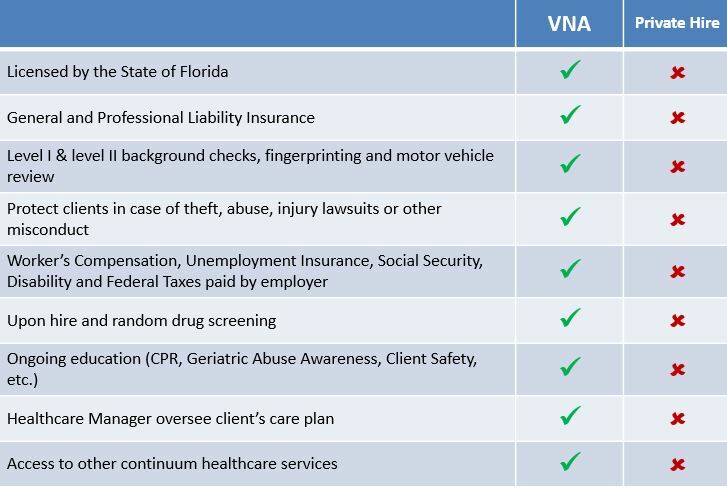 The VNA follows the mandated Level II background screening for all of its employees. However, we feel it is important to go beyond just basic requirements. The VNA voluntarily conducts Level I screenings, which gives our clients an added layer of security.